Below is an article written by Catherine Doe, reporter with the Valley Voice newspaper serving Tulare and Kings Counties in Central California. It was printed November 21, 2013. We are each a soul living a human experience. Did you ever wonder what your soul’s agenda is? All you have to do is look at your hands. Or have Kay Packard, founder of the American Academy of Hand Analysis, read your hands for you. When Kay was 38, she woke up one day and asked herself, “Why am I here? Because this can’t be it.” It took five more years of searching, but after some friends encouraged her to get her hands read it changed her life. 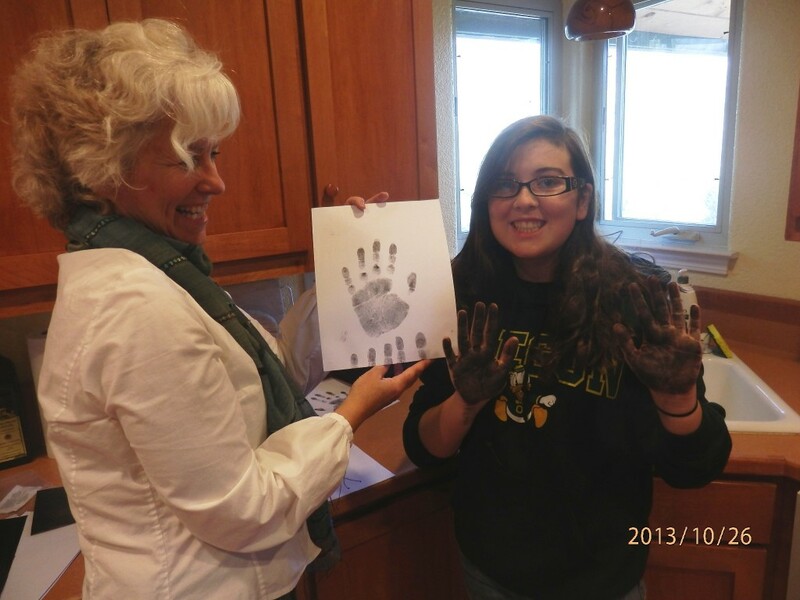 Our daughter, Mercedes, a freshman at Exeter High School, was eager to get her hands read, so I drove her up to Kay’s Three Rivers studio to discover her life’s purpose. Kay starts by taking prints of both hands. Because we live in a right-handed world, even lefties use their right hand most often. Only one percent will predominately use their left hand and Kay can tell because the left print will come out stronger. The right hand represents the person in the outside world and the left hand represents how they are at home. Her analysis is based on both the physical hands and the small details that can be better seen on the prints. Living in Three Rivers could limit her clientele, but Kay does about ninety percent of her readings by long distance, either over the phone, Skype or on the computer. She sends the client a print kit, which is returned with their payment. Kay has thousands of prints and keeps an archive in case the client wants her to do a follow-up reading and compare any changes that might have happened in the hand’s lines. Kay starts the reading by examining her client’s fingerprints. “I look at the finger tips to see what the soul’s agenda is,” said Kay. Your fingerprints were formed when you were in the womb five months before birth and are unalterable from that point forward. She can’t tell you when you will get married or how many babies you will have, but your fingertips can tell you what your soul wants to experience. She will be able to see what life’s lessons will come your way and what challenges you will face. Coming to an understanding that struggles are really life lessons is what makes a hand analysis such a transformative experience. A client’s view can fundamentally change from negative feelings of sorrow and anger, to feelings of gratitude for their struggles. “Those struggles will ultimately strengthen your soul’s purpose,” said Kay. The lines on your hand, such as the heart, life and head line, and any markings that stand out like whorls, dots or stars, can reveal some of your talents, gifts and strengths. Your palm also reveals some of the challenges you are facing in life. After letting her eye wander over Mercedes’ hand, like looking through a forest and seeing what pops out, Kay revealed that Mercedes’ life purpose was to be a teacher. This does not necessarily mean a teacher in the traditional sense but could mean being a mentor or guide or example. “She is the go-to girl for information,” Kay explained. Service apparently is Mercedes’ life path, and when she teaches in the line it is going to bring her great satisfaction. Mercedes will pursue three avenues of service: one to herself, a second to her family, friends and community and a third to make the planet a better place. One of her biggest life challenges will be to keep these three areas of service in balance and not lose herself in the process. One of Mercedes’ biggest life challenges will be engaging in power struggles. People will try and have authority over her, or will be telling her what to do and when. She will have to learn to stand her ground and and decide for herself when, and how, she is going to be of service. “By default, your little soul is a helper: reliable, dependable and capable of doing a great job,” said Kay. Another challenge for Mercedes will be to figure out when to jump into a relationship or when to stay back. She is also a healer, which ties into her teacher role, in the sense she has the capability to listen and give people good advice – leading them to be able to heal themselves. The heart line, the first major line on your palm, reveals how you relate to people and how you like to be treated. Mercedes had a hermit heart line, which means she needs to have her own space, her own sanctuary. She needs to take her time to decide how she feels and needs to be alone with her thoughts. Surprises aren’t her thing and loyalty is important to her. She won’t have a large group of friends but a few good friends. The middle line on your palm is the head line, which represents your mental system. Mercedes head line indicates that she is very creative and more emotional, which is in conflict with her hermit line. Kay advised journaling to relieve this conflict between the two. The life line is the last of the three dominate lines on your palm. It does not indicate how long you will live but how vital your energy system is. A long clear life line means that you have good health and bounce back quickly if you get sick. Other prominent features on Mercedes’ hands were her girdles of Venus, the star of Apollo, and a peacock on her index finger, which meant she was sort of a maverick. Kay also looks at each finger and the shape of your hand. The dominant finger is the straightest and most prominent. The shape of the hand can be determined by taking off the thumb and determining if you have a square, pear or other shaped hand. Kay was emphatic when she said that anyone can learn to do hand analysis. It does take some intuition, but intuition develops by default after doing readings for awhile. Everything is a vibration, and hands are a vibrational imprint, so “I’m not only looking at your hands but I am feeling them also.” This intuition can develop by itself, but Kay’s graduate program at the University of Santa Monica had techniques that helped her tap into her inner voice. Kay just finished writing her first book, Your Life is in Your Hands and is currently looking for a publisher. In it she reproduces fifty handprints so that readers can pick out markings similar to theirs and do their own mini-reading. Kay Packard, M.A. is the Founder and Director of the American Academy of Hand Analysis. Visit www.academyofhandanalysis.org or the contact form to get in touch with Kay. Click here to open and print PDF version Hand Analysis Can Prove Insightful. To return to this page, hit the back button after opening the PDF document.